Pakistani candidate in IELTS." Photo courtesy of British Council of Pakistan. passed the British Ordinary Level (Level) examination. Sitara Brooj Akbar, at the age of 11, passed six level subjects including Mathematics, Physics, Chemistry and Biology. 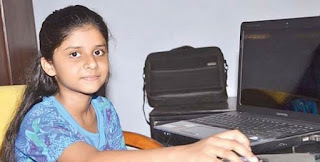 We do not need any sort of monetary aid from the government, we just want the government to recognise that Sitara has made a shining example for Pakistan on the international stage and she is the daughter of Pakistan, Sitara's father Ali Akbar told Dawn.com. Ali Akbar added that the British Council has declared and recognised Sitara's feat as the world's youngest student to have passed [ level exams. However, she has only been declared the youngest IELTS candidate in Pakistan, and not across the world, as the British Council is yet to confirm her feat globally. Speaking to Dawn.com, Sitara's mother mentioned that her daughter is a great fan of Dr Abdus Salam, Pakistan's sole Nobel laurete and aims to become a top researcher in the field of biochemistry.